China's 'health ministry', the National Health and Family Planning Commission, has told doctors in the public hospital system that they should seek additional work in private hospitals. Health minister Li Bin told a conference this week that the registration regulations for doctors had been changed to encourage practitioners to work outside of the public hospital system. 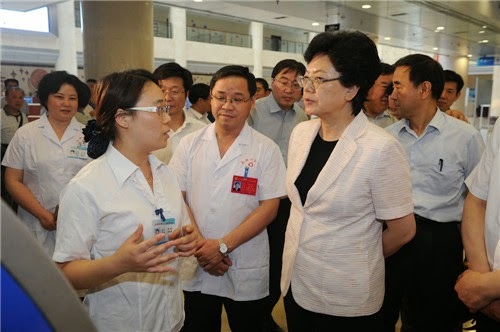 "Limited resources of talent will be optimized among hospitals of various types under the initiative, which helps with the sustainable and healthy development of privately funded medical institutions," she said. Doctors will no longer 'belong' to public hospitals and will be encouraged to work for market-set fees in private hospitals. According to the China Daily, one senior doctor said he hoped his patients would 'follow' him to the better environment of the private hospital where he intends to practice, despite him charging much higher fees there. The health minister told a NHFPC conference this week that she was urging private health institutions to provide a range of healthcare services, both treatment and prevention, to help divert patients from public hospitals, which are usually overloaded with work.